L 4 3/4″ (12 cm). Sharp “chink.” Song is series of accelerating thin notes, often ending with several low notes. 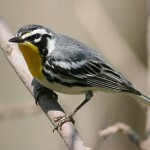 Description: Gray head and neck; darker gray wings; greenish-yellow rump; whitish below with yellow patch on breast and yellow undertail coverts; bold white eye ring; reddish crown patch is seldom visible in the field. Female is duller overall. 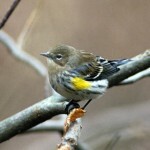 Fall immature is brownish-gray above, with little or no yellow on breast. No wing bars. Behavior: Male sings while feeding. Food: Forages for insects and spiders near the ground. 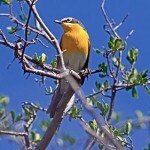 Habitat: Usually found in brushlands and pinyon-juniper woods, often at elevations between 6,000 and 9,000 feet. Where in Nebraska: Accidental. Seen in North Platte, Lincoln County in 1964. 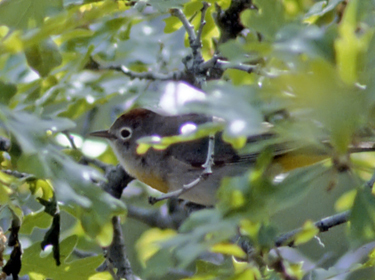 Fun Facts: Virginia’s Warbler is not named after the state of Virginia rather it was named after Virginia Anderson who discovered it in New Mexico in 1858. Copyright © 2019 Nebraska Bird Library. All rights reserved.